The professors, joined by students from various disciplines and courses with interest in the Arabic language, discussed Arabic’s relation to artificial intelligence, machine translation, modern media, legal language, and rhetoric in social media. Speaking on behalf of Dean of the Faculty of Arts Dr. Majdi Al-Malki, Dr. Sami Sha’th – assistant to the dean – noted that the symposium is a continuation of the Department of Arabic’s remarkable efforts to encourage research and publication. “The papers presented here explore several facets of the Arabic language within a broad perspective that addresses multiple complex issues and presents future considerations for debate,” added Sha’th, quoting Al-Malki. 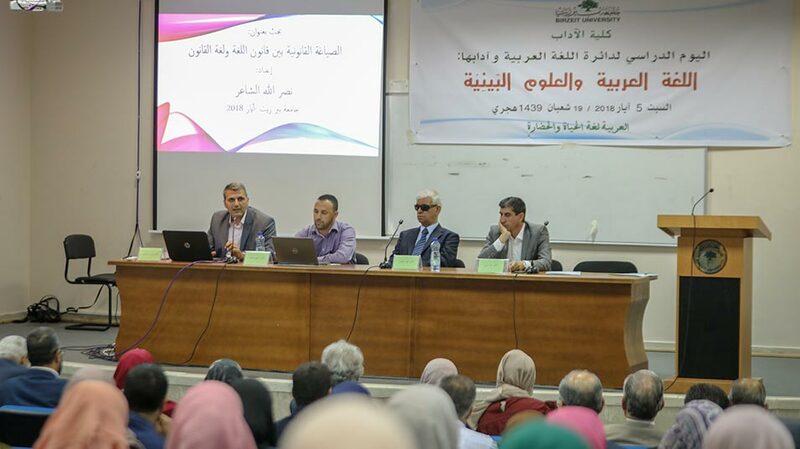 Chair of the Department of Arabic Language and Literature Dr. Mousa Khoury highlighted the department’s research-focused strategy, saying that the professors tackle research issues with a renewed vigor each and every year. “I know full well that the Department of Arabic Language and Literature has one of the most competent, active research teams, who delve into translation, linguistics, semantics, semiotics, and many other areas of language analysis. This breeds an environment of positive competition among our professors and faculty members,” said Khoury.